When I say friend, I mean a fortune cookie from a dodgy Chinese restaurant in the inner west. I was trying to impress you for a second, but I’ve given up. I’ve thought about this riddle all week. I even told my middle-aged co-worker about it who replied with, “You have no idea what you are saying, so don’t expect me to understand.” She was tough but fair. So I sat down and thought about why I had been thinking about this so much. I have had plenty of fortune cookies with advice that I’ve brushed aside; one told me not to take myself so seriously, and in the same week, I went out and bought business cards. Please let me know if you would like one, and they make great office decorations. So, I sat down and thought about why I cared so much and by sat down, I mean I didn’t put my headphones in on public transport – unheard of, if you're under the age of 30. This resulted in my doing some great thinking and also getting super invested in the couple’s conversation behind me. They couldn’t decide what to have for dinner, she wanted pasta he wanted pizza, and I wanted them to realise lots of pizza shops also sell pasta. The conclusion I came to is this: I don’t do certain things because I decide it’s not very ‘me.' I’ve created limitations on myself, so I might not do a yoga class with friends because I’ll decide it isn’t very ‘Mary’. I’ve decided who I am and sometimes that does stop me from exploring new things. Occasionally this is a good thing. A friend once tried to persuade me to join a pyramid scheme but I luckily decided it wasn’t very ‘me’. Other times, however, it is to my detriment. I am beginning to understand that what I consider ‘me’ or ‘Mary’ is constantly evolving like Madonna’s hairstyles or Hilary Duff’s pop career (Breathe in Breathe Out is an underrated smash that should be given more consideration). For instance, there was a time in my life where I thought I could never live without my Hello Kitty Television, but then I discovered High Definition Television – see, I'm constantly evolving. Sky Sirens is the perfect example of this kind of thinking. I decided not to do Sky Sirens because I declared it wasn’t very ‘me’. I’d wanted to sign up to Sky Sirens for a while, and I followed Sky Sirens and a few of their instructor's on Instagram. I enjoyed seeing what they post because I love the outfits and they always look powerful, strong and like they’re having fun. Still, something was stopping me, and it was me. I did not feel like Sky Sirens was something I could do because it was something I had never done before, so therefore it wasn’t very ‘me’. Also, it looked quite hard, and I’m naturally lazy, you know how some people say things like, “I just need to get out of the house.” I have never had that need. I used to follow a few gym addicts that did not look like they were having fun, so the Sky Siren’s Instagram was a welcome relief; maybe the gym junkies were having fun. It just did not look like fun for me. To be fair it’s hard to have fun when you are ‘planking.’ I have no idea what planking really is, but a I girl worked with who went to the gym talked about it a lot. She always wore activewear that cost $200 for just a pair of tights and a crop top, often with a boring pattern. Sky Siren’s Instagram became one of my favourite things to pop up on my feed. Unlike a lot of places that offer exercise classes, it felt like it was about making people feel good not trying to change people. A lot of places are all about weight loss, and I understand that maybe that has its place, but I find it incredibly uninspiring. Why be thin when you can be strong instead? So I decided to take the plunge and do something that I had considered not very ‘me’. Exercise! This week is Week 5, and I have spent five nights doing something outside of my comfort zone. Weirdly, it has started to feel more and more like ‘me’ every week. I’ve done five hours of pole dancing and considering my baseline that doesn’t sound like a lot, but it feels like a lot, especially in my legs that ache for a few days afterwards. When I attended my first pole dancing class, I was stressed – imagine a social media influencer unable to get a sponsorship with a teeth whitening company – stressed. The whole first class, I felt awkward, nervous and clumsy. Although I didn’t leave regretting attending my first pole dancing class, I still thought that maybe this was not for me. However, a lot has changed. This week we built on our skills and practised our routine, which we can perform at the end of the term and have it filmed, although performing is optional. This routine is my favourite part of class, not because I’m particularly good at it; I’m not good at anything just yet. I spend most of the class just trying to remember my right from my left. I like the music that plays while we do the routine – what can I say I love a jam – and I like seeing the progress I’ve made every week. It’s easy to measure because the routine is the same every week, so I can easily spot when I am faster at something or make a smoother transition between moves. “The most significant change I notice each week is how much more comfortable I am in class. This week in class we also had the opportunity to choose a move we wanted to improve on or practice again. For me, this is pretty much every move, except when we get to drop to the floor. I’m great at sitting down, what can I say? However, it was interesting to see that everyone had different suggestions, everyone struggled with different things. A few of the people in my class expressed disappointment that they couldn’t quite nail a move or expressed their concerns that they may never be able to do something. It made me realise, that starting something like pole dancing no matter who you are, or your level of athleticism, is always out of your comfort zone, at least at the beginning. Everyone feels a little awkward and unsure of themselves, and it’s all a part of the experience. The great thing is everyone grows in confidence as the weeks progress. I no longer feel nervous about classes or awkward, I look forward to them. I think everyone in my class feels the same way to some extent. After five weeks together there's less awkward small talk and more, “You won’t believe what my housemate is using instead of toilet paper.” This kind of friendliness creates a great vibe in the classes and makes me feel like I belong. This week I lost my grip on the pole and stumbled slightly which in Week One would have horrified me, now I laugh it off because I feel so comfortable. Not as comfortable as my Mum feels opening my mail, but pretty comfortable. I think it is pretty fair to say you need to try things more than once before you know if you will like it or not. 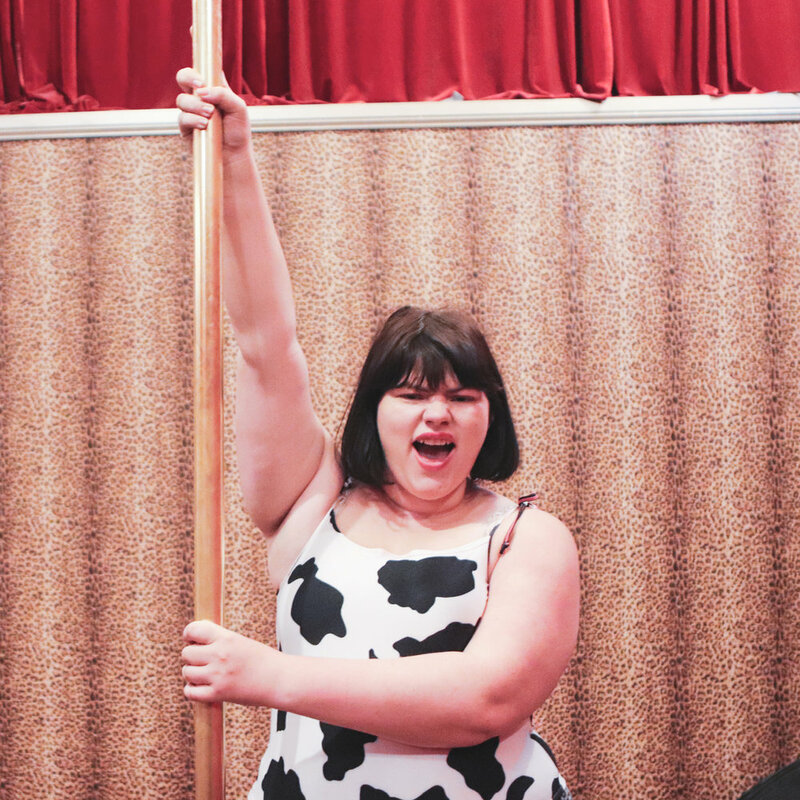 After my first pole dancing class, I left feeling a bit anxious and nervous. I’m the kind of girl you meet for a lot of alcohol consumption; not for an exercise class, but persistence is the key. It is Week Five now, and even though I’m still not an expert and I may never be an expert, I am enjoying the journey, as every reality show contestant likes to say. I’ve reached the stage where I’m comfortable in my class, comfortable with failing and succeeding and all the in-betweens. I even remember to bring a drink bottle now; sadly I often forget to bring it home. “The fortune cookie was right. We decide who we are. So I’ve decided I’m a pole dancer who can barely keep hold of a pole and that is the new ‘me’."